2 of 5 Melt butter in a 10-inch oven-proof nonstick skillet over medium-high heat. Add shallots and cook for 4 minutes, stirring occasionally. Add capicola and cook for 1 minute. 3 of 5 Whisk together eggs, milk, pepper and nutmeg; stir in 4 oz of the cheese and pour into skillet. Cook for 5 minutes, stirring once after 2 minutes. 4 of 5 Place skillet in oven and bake at 350 degrees F for 5 minutes. Scatter remaining 2 oz cheese on top and bake an additional 5 minutes until frittata is set. 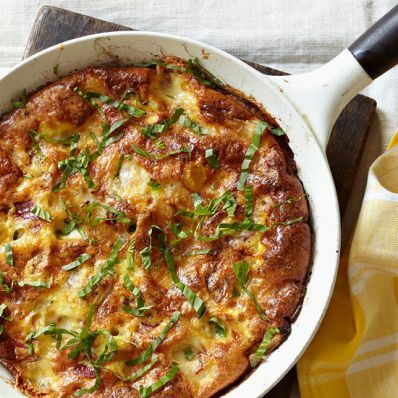 5 of 5 To serve, gently slide frittata onto a serving plate and garnish with basil, if desired. Per Serving: 638 mg sodium, 383 mg chol., 25 g Fat, total, 13 g sat. fat, 336 kcal cal., 0 g fiber, 4 g carb., 23 g pro.